Golf is an incredibly engaging and satisfying game. It relishes your mind while at the same time challenge your body as it’s a physically demanding sport. You need to have a proper back up in order to bring out the best performance. The sport gets even more challenging when it’s start raining. And, you need some good clothing; best golf rain pants, being one of them. Yeah sure, you can use some waterproof jacket as well, but that won’t cover your whole body. You need to have a good pair of golf waterproof pants for maximum comfort and flexibility. A good pair of golf waterproof pants are made with 100% polyester material, that is durable, comfortable and also windproof. You wouldn’t want to compromise a bit on your swinging ability and for that reason, you need to have everything top notch. There are tons of golf pants available online, which you can rely on. But, sometimes, it can become a plethora of trouble to pick the right one in such a crowded market. Don’t worry a bit, as we have handpicked some of the best golf rain pants that you can get on Amazon. Some of the pants could make a hole in your pocket, but we feel, it’s necessary to choose the best quality, when it comes to best golf rain pants. The first one in our list is from a reputable sports brand, Adidas and they have provided the quality you would expect from them. It comes in a dark black color, looks great and made with 100% polyester plain weave with PU coating, which make it very comfortable and flexible. One thing to note is that its length is a bit long, even for a 6 ft. man. So, you might need some alteration to make it a perfect fit for you. Otherwise, it is easily one of the best golf rain pants, which is waterproof, light-weight, thin and comfortable. It’s also very compact that can easily fit in your golf bag. You can’t expect more for the price it comes in. All in all, it is value for money. 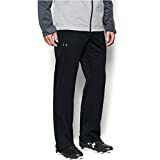 Helly Hansen Men’s Voss Rain Pant is made with a special rubbery material that is both stretchy and completely water resistant. It will keep you dry throughout the day, regardless of how much is it raining. It’s rain repellent ability is excellent. It does compromise a bit on breathability but then again, you can’t expect everything at the price it comes at. Also, surprisingly, these are very warm pants and you won’t be requiring any extra piece of clothes in the cold winter as well. These are very rigid and durable pants, thanks to its 100% Polyurethane fabric. The fit is good enough, and Helly Hansen offers a wide variety to choose from, with over 9 sizes for options. Under Armour comes under a premium price band, and they have certainly delivered the quality as well. It is equipped with an advanced UA technology which provides maximum water repellent ability as well as allow maximum breathability. These are made with 100% polyester which gives an unmatchable comfort and feel. It is equipped with a 2-layer bonded fabric that sow all the moisture on your pants to make them dry as quickly as possible. On the contrary, they have provided two pockets on the sides and a rear pocket as well. For a secure fit, you have elastic side adjusters on the waistband. Honestly, the company has not skimmed on anything and they have justified the price point. Proquip Aquastorm Pro are fully waterproof golf pants designed with a special PU coating that claims to give the best performance while swinging a shot. It has a beautiful stain finish that is very comfortable, soft and also very quiet during the swing, which is often missing on rustling fabrics. They have an athletic feel to it, thanks to its slim cut edges. It gives them a sporty look and comes in bold contrasted colors. The pants are very lightweight and comes with waterproof zips at the rear Velcro pockets and at the front as well. You can carry your phone, wallet or any important stuff in these pockets without worrying about a thing, it is fully waterproof. The Proquip Aquastorm comes with a three-year waterproof guarantee and considering all the aspects price, it would be safe to say that it is the best bang for your buck.